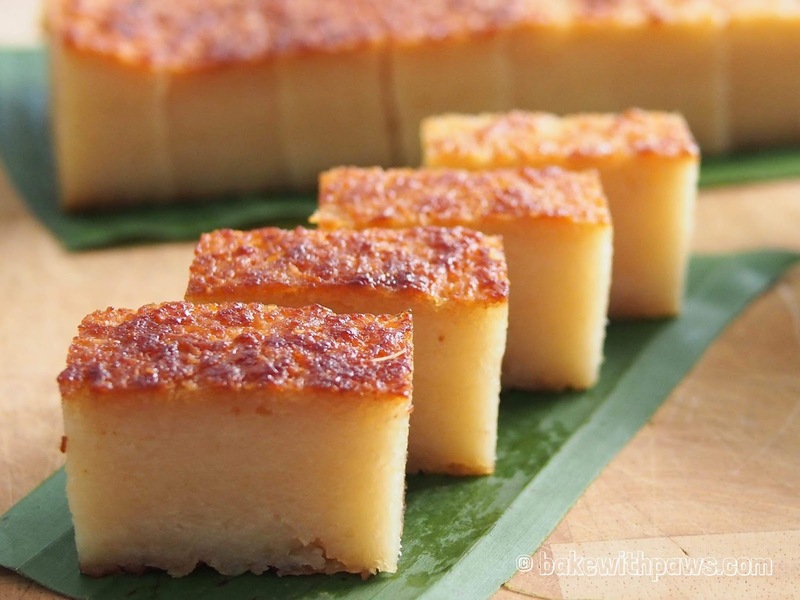 In Penang, we call this Chiu Chu Kuih. I tried this recipe from Nonya Flavours with minor modifications. It tasted very good but the texture is not QQ (springy or bouncy texture) like those sold by vendors. I think the reason is because this recipe uses 100% Tapioca with very little Tapioca flour. 1. Line the bottom and sides of baking pan with banana leave and grease with some vegetable oil. 2. Preheat oven to 190C (170C for fan mode). 3. In a mixing bowl, whisk egg and sugar with a hand whisk. Add in the rest of the ingredients and blend until well combined. 4. Pour the mixture into the prepared pan. 5. Bake at preheated oven for 90 minutes or until the top crust is brown. 6. Remove from oven and leave it to cool for couple of hours before cutting to your desire size. 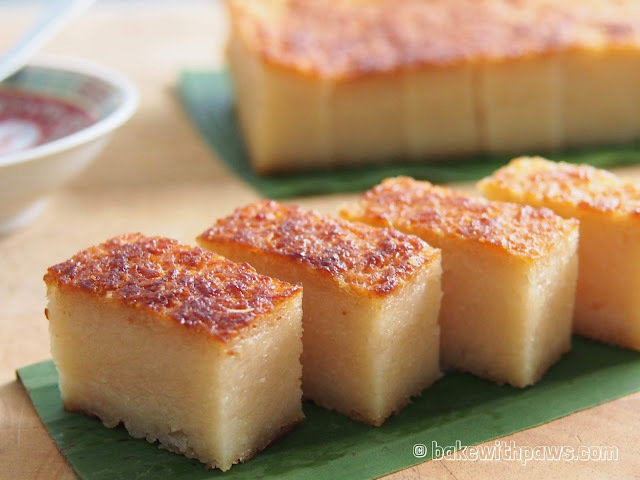 Love this kueh. How do I do it in a 8inch square pan? How do I increase it? Thanks Bakewithpaws. Thank you for dropping by. You may want to try the 1kg grated tapioca recipe. Please multiply 1.25 for all the ingredients. Please double check my calculation. I hope is correct. Happy baking. I have a small doubt only 17 gms of butter?? Hi ...can I skip putting tapioca flour? I am so sorry for late response. The tapioca flour is actually help to hold the ingredients together. It should work too without the tapioca flour. Can I substitute tapioca flour with cornflor ?? Thanking for dropping by. I never tried with cornflour. But, I think should work the same. Hi ....can i skip putting tapioca flour?